Extrusion blow molding is a method used to make plastic items such as carrying cases. A melted resin is poured into a mold and forms a predetermined shape. The shape of the item is determined by the shape of the mold. A solid shape forms when the extrusion cools. 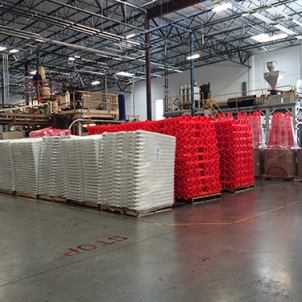 It is a complicated process and usually requires professional extrusion blow molding services. The plastics extrusion process involves a resin being added into a top mounted hopper. The resin moves along a track until it reaches the extruder barrel. As the resin nears the barrel, a rotating screw forces the resin into the barrel. The barrel is heated so it will melt the incoming resin. A heating profile sets controlled heat zones to gradually increase the temperature inside the barrel. The zones allow the plastic resin to gradually melt as it travels through the barrel. Before the resin exits, it is pushed through a screen to remove contaminants. At this point, the resin enters the mold and takes its final shape. The hot plastic must flow evenly into the mold or it will produce a misshapen product. If the resin receives unwanted stress anywhere in the process, the product can warp when it cools. The final step involves cooling the product by pulling the extruder through a water bath. The extrusion process is complicated and requires precision. If you need extrusion blow molding services, then it is important to contact a professional. Inquire about a consultation to get the service you need to create a perfectly shaped product.